This is my old outfit . . . of course, I wasn't in Vietnam, and I didn't do what these guys did. They are the type of heroes who were still serving as Platoon Sergeants, First Sergeants when I was a private. 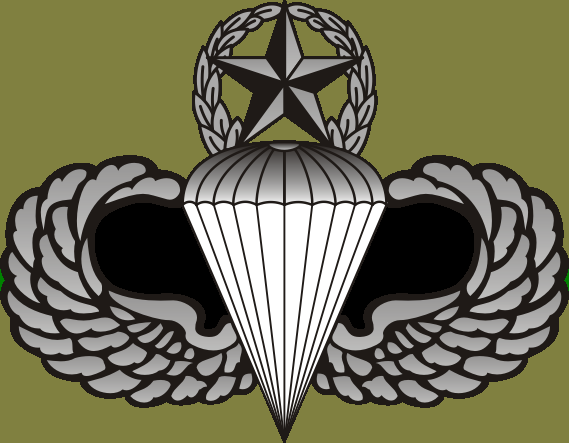 When I got to Special Forces, they were the Team Sergeants, Sergeants-Major, and crusty old Warrant Officers - S.L. 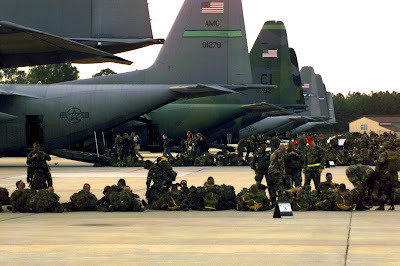 6/23/2011 - MacDill Air Force Base, Fla. - In the steamy jungles of Vietnam in 1957, nearly eight years before America began major combat operations there, members of the U.S. Army's 1st Special Forces Group (Airborne) were in country, advising and training indigenous warriors. It was all on the down-low, as were all missions until the end of the war. Secrecy is stock and trade of the Green Berets, after all. But it was no secret in Tampa this week when some 200 veterans of the famous unit gathered for a ceremony at U.S. Special Operations Command at MacDill Air Force Base Monday. Arriving in town over the weekend, the group of old soldiers staged at the DoubleTree Hotel at Rocky Point. It was a time to remember, laugh and shed a tear or more for those who were lost. 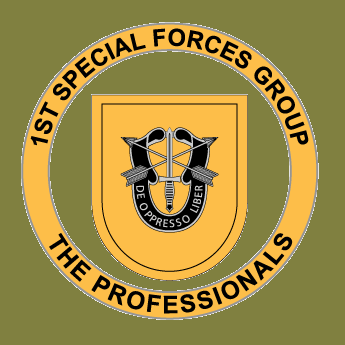 Formed at Camp Drake, Japan, June 24, 1957, 1st SFG served in the Pacific region and provided some of the first American military members to serve in Vietnam. It wouldn't be until 1965 when major combat operations would begin, sending many members of the 1st on very dangerous missions well behind enemy lines. "We were the front line - sometimes 70 miles behind what they called the front line," said retired Master Sgt. David Kauhaahna, who joked that his special forces code name is "Brother K."
He arrived in country November of 1965, and served in Laos among other places. Like most others of the 1st, he operated in small units, usually just six men. Three of them might be indigenous Montagnards, or mountain people who earned a reputation as some of the toughest warriors and expert jungle guides in the country. Being so far behind lines, and with support far away, there was always the risk of not making it through any mission. "Lots," said Sergeant Kauhaahna of close brushes he had with death. "Lots of times." One sticks out in his memory. "We were surrounded by enemy, and they had set the elephant grass on fire and it was closing in on us," he recalled. "We thought that was it for us, but helicopters got there just in time to pull us out; we would have been slaughtered." Close calls were part of the job, said retired Sgt. Major Billy Waugh, who served just shy of eight years in Vietnam, and has a Purple Heart for all eight (along with a Legion of Merit, a Silver Star and four Bronze Stars). "A lot of what we were doing was directing air strikes (targeting and surveillance as members of the Studies and Observation Group)," said Sergeant Waugh, who recalled that the U.S. Air Force fighters and bombers evolved into being "very effective" at tactical air strikes during his years of service. "They took a little while to get the hang of it, but once they did, they did a heck of job." 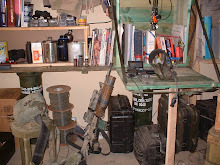 When not performing SOG duties, "Our job was to kill and destroy," said Sergeant Waugh. 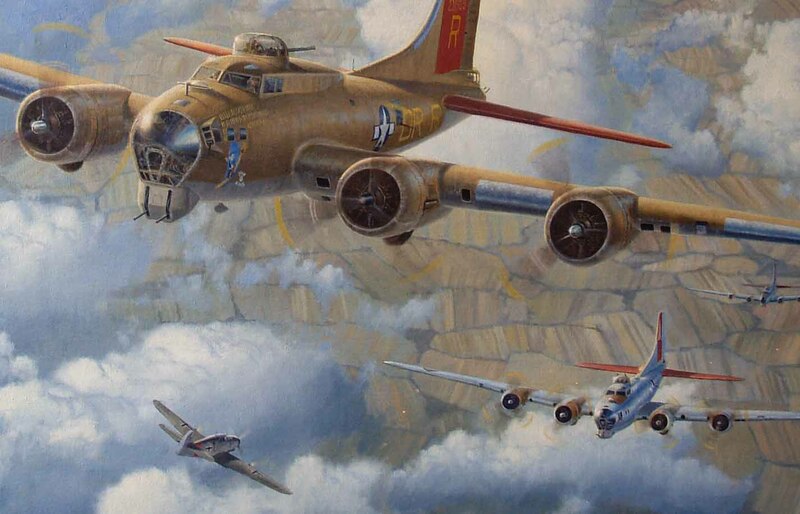 Members of the 1st were invaluable to downed pilots in need of rescue behind enemy lines. "We were the only guys there, so we did the job," said Sergeant Waugh. The memories fill volumes, and are only outnumbered by the close kinships members of the historical group share, said Sergeant Waugh, which is why the reunions are regularly held. This year's event marks the first in Tampa, and a special one in that it was in the same town as MacDill Air Force Base and SOCOM. "We are glad we could gather here this time," Sergeant Waugh said. "It's a sort of coming together." THE NAVY BOUGHT FAKE CHINESE MICROCHIPS . 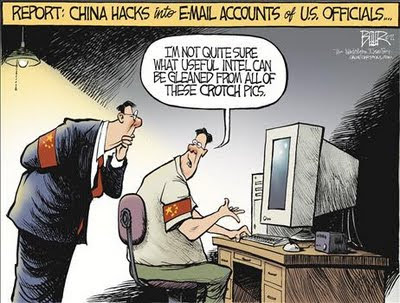 . .
Last year, the U.S. Navy bought 59,000 microchips for use in everything from missiles to transponders and all of them turned out to be counterfeits from China. Wired reports the chips weren't only low-quality fakes, they had been made with a "back-door" and could have been remotely shut down at any time. 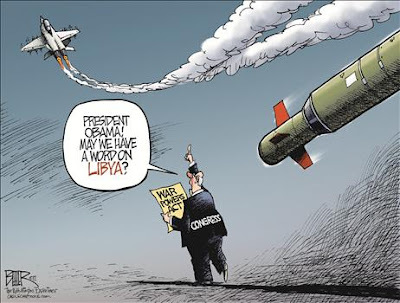 If left undiscovered the result could have rendered useless U.S. missiles and killed the signal from aircraft that tells everyone whether it's friend or foe. 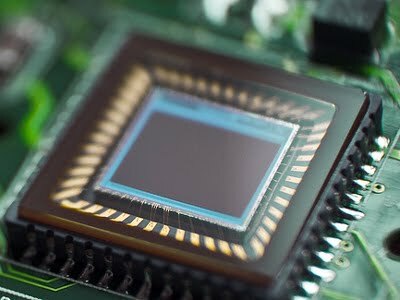 Apparently foreign microchips are often cheaper, but there are legal issues for defense contractors when going outside of the U.S. for source items. Another problem are possible "trojan-horse" circuits that can be built into the chip, almost impossible to detect - especially without the original plans for comparison. Competent Special 0perations Forces cannot be created after emergencies occur. We buried this warrior on Fort Leavenworth this morning. The entire post, to include the Command and General Staff College student body, the School for Command Preparation (Brigade Commanders prep course) and the School for Advanced Military Studies (SAMS) emptied their classrooms and hallways to line the roads of the post to bid a proper farewell to this hero. We are currently running a combined training operation with the Brits (over 200 here TDY) and have over 100 international officers from around the world, who are students in CGSC Class 11-02 and 12-01. They all participated in the event and based on the muted tones and lack of cohesive gaggles, I'd say to the last man they were in awe of the way we pay respect to our soldiers who have paid the ultimate sacrifice. 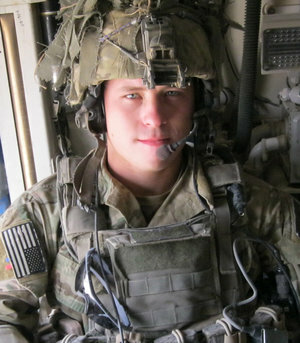 US Army Staff Sergeant Jeremy A. Katzenberger, 26, of Weatherby Lake, Missouri, died June 14, 2011 in Paktika province, Afghanistan, of wounds suffered when insurgents attacked his unit with small arms fire. He was assigned to the 1st Battalion, 75th Ranger Regiment, Hunter Army Airfield, Georgia. SSG Katzenberger was buried with full Military Honors at Fort Leavenworth, Kansas yesterday, 28 June 2011.
. . . and "Thanks Good Buddy" to LiveFreeOrDie up in New Hampshire - S.L..
USA MARINE CORPS ? ? ? 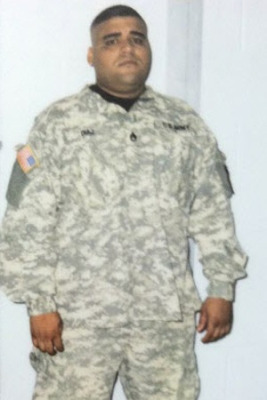 NEW YORK - A man was arrested after he donned an army uniform and posed as a soldier so that he would get bumped up to first class on a flight from the Dominican Republic to New York's John F. Kennedy (JFK) International Airport, the New York Post reported Monday. Rock Diaz, 22, of Long Island, He was busted when a sharp-eyed customs official at JFK asked him his rank - and he gave an answer that did not match the insignia on the uniform he was wearing. Asked his rank, he said "E-5," referring to a pay grade. But Diaz was wearing the insignia of a staff sergeant, the source said, which is "E-6," a higher pay grade. He also couldn't say where he was stationed, sources said. But Diaz - in camouflage fatigues and sporting a military-style buzz cut - allegedly insisted that he was the real thing when questioned after getting off an American Airlines flight. Although he was wearing a standard-issue army combat uniform and cap, he could not produce a military ID. Diaz - who sources said never served in the military - also had a black POW patch on his sleeve, which an actual soldier would never wear in that spot, the sources said. His dog tags were comically engraved with the words, "USA Marines Corp."
'USA Marine Corps' - what a doofus. I wonder if he was served the salami last night on Riker's? The Spanish-speaking Diaz said that he did nothing wrong and blamed any confusion on a language barrier. Oh yeah - like THAT's original. Somehow it doesn't fly with a guy wearing staff sergeant rank. A private in Basic, right out of the islands - MAYBE. A mid-grade NCO? "No way, Jose." "If you knew anything about the military and you looked at him, you could tell he wasn't really a soldier," a cop said. Diaz was charged with second-degree impersonation. 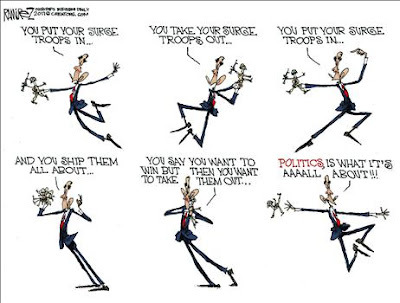 This is great - used to be all kinds of swine could get away with dishonoring the uniform and veterans. Nowadays thanks to the Internet, we know the rules and when we see through the B.S. we know what to do about it. Kudos to that sharp-eyed, fast-thinking Customs officer, whoever you are. If I ever run into you in a bar, I'll buy you a beer. The Battle for Brest was one of the fiercest battles fought during Operation Cobra, the Allied breakout of Normandy which began on 27 July 1944, during the Battle of Normandy during World War II. Brest was surrounded and eventually stormed by the U.S. VIII Corps. 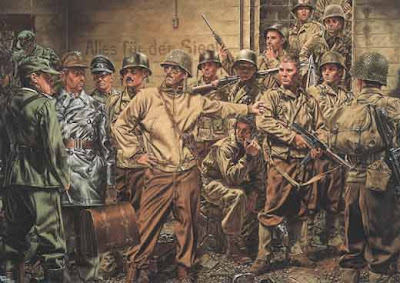 The fight proved extremely difficult, as the German garrison was well entrenched and partially made up of elite Fallschirmjäger (paratroopers) forces. Festung Brest ("Fortress Brest") was under the command of General der Fallschirmtruppe Hermann-Bernhard Ramcke, a paratroop veteran of the Afrika Korps. 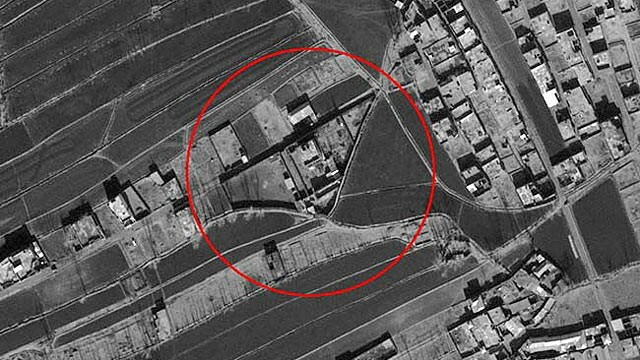 General Ramcke eventually surrendered the city on 19 September 1944 to the Americans after rendering useless the port facilities. When U.S. Brigadier General Charles Canham arrived to accept his surrender, General Ramcke asked the lower-ranking man to show his credentials. Canham pointed to his nearby troops and said "These are my credentials". 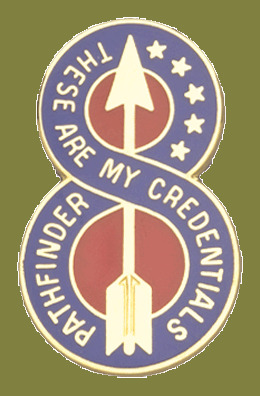 Canham was at the time the deputy commander of the U.S. 8th Infantry Division, and that phrase has become the division's motto. EVERYBODY KNOWS that the period of a pendulum is proportional to the (square root of the) length of the line suspending the weight. The longer the pendulum, the slower it swings (i.e. the longer the period). "Pendulum" is derived from the Latin "pendulus", of course, meaning "hanging". Pendulums were used as the most accurate form of time-keeping from the time of Galileo, who discovered their basic properties, until the 1930s. 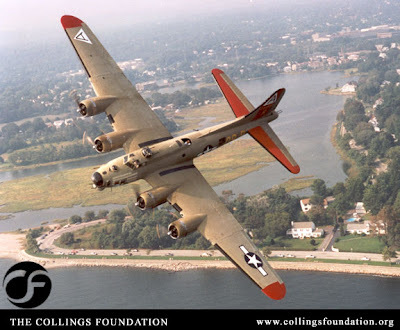 The Nine-O-Nine completed 140 combat missions with the 323rd Bomb Squadron, 91st Bomb Group during World War II - believed to be the Eighth Air Force record for most missions - she never lost a crewman as a casualty. The Nine-O-Nine was a block 30 B-17G manufactured by the Boeing Company, she was nicknamed after the last three digits of her serial number: 42-31909. 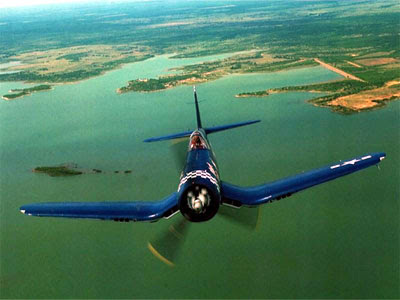 She was added to the USAAF inventory on December 15, 1943, and flown overseas on February 5, 1944. After depot modifications, she was delivered to the 91st BG at RAF Bassingbourn, England, on February 24, 1944, as a replacement aircraft, one of the last B-17s received in factory-applied camouflage paint. A former navigator of the 91st BG, Marion Havelaar, reported in his history of the group that Nine-O-Nine completed either 126 or 132 consecutive missions without aborting for mechanical reasons, also believed to be a record. M/Sgt. Rollin L. Davis, maintenance line chief of the bomber, received the Bronze Star for his role in achieving the record. The Nine-O-Nine's first combat mission was Augsburg, Germany on February 25, 1944. 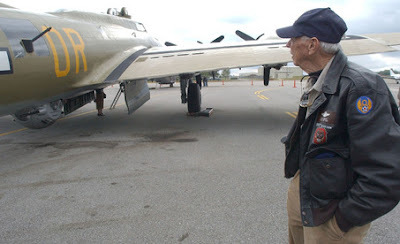 She dropped 562,000 pounds of bombs, and flew 1,129 hours. 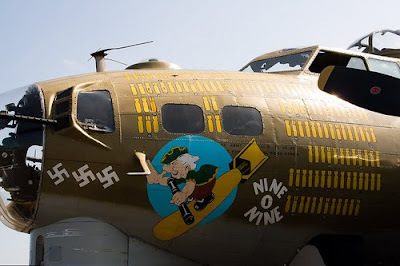 The letter “B” was painted on ten of the 140 bomb symbols to represent ten missions “Nine-O-Nine” flew to Berlin; she was credited with downing three enemy fighters. She had 21 engine changes, four wing panel changes, 15 main gas tank changes, and 18 changes of Tokyo tanks (long-range fuel tanks). 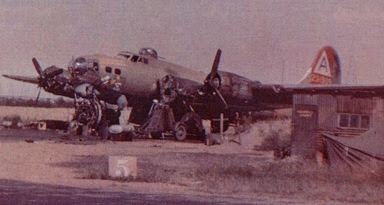 After the end of hostilities in Europe, Nine-O-Nine was returned to the United States on June 8, 1945, and was consigned after the war to the RFC facility at Kingman, Arizona on December 7, 1945. Sadly, she was eventually scrapped but thanks to dedicated hard-working enthusiasts, the Nine-O-Nine flies again! B-17G-85-DL, 44-83575, civil register N93012, owned and flown by The Collings Foundation of Stow, Massachusetts, currently appears at airshows marked as the historic Nine-O-Nine. Israeli politicians and soldiers have repeatedly been threatened with arrest in the United Kingdom in recent years because pro-Palestinian activists have exploited a law allowing foreign visitors to be detained for alleged human rights violations anywhere in the world. As I discuss in my column at The Week, a law which has strained Anglo-Israeli relations — and embarrassed successive British governments — finally seems likely to be amended. Doron Almog is a true hero of democracy and human rights. In 1976, Almog parachuted onto the runway at Uganda’s Entebbe airport, marking the way for the Israeli commandos who rescued 256 hostages aboard a hijacked Air France jetliner. During the operation he led the assault on the airfield's control tower. Almog officered the airlift that rescued 6,000 Falasha Jews from Ethiopia in the 1980s. 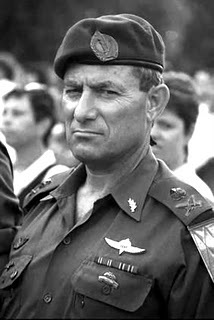 As head of Israel’s southern command from 2000-2003, he defeated every attempt by terrorists to infiltrate into Israel from Gaza. Almog lost five members of his family to a suicide bomber in Haifa in 2003. After the death of his own mentally handicapped son, he founded a charity to provide services to the severely disabled in southern Israel. In the fall of 2005, Almog visited the United Kingdom on a fundraising mission for his charity. On landing, he was informed that British police officers were waiting to arrest him. A pro-Palestinian British lawyer had sworn out a complaint against Almog for his anti-terrorist work on the southern front. Under British law, any foreign visitor to Britain can be accused of human rights violations by any private person in Britain, and brought before a British court to answer for actions anywhere on earth. Almog remained on the plane and returned to Israel without disembarking. He was the first Israeli to be attacked in British court in this way, but not the last. In the years since 2005, pro-Palestinian activists have repeatedly attempted to use British law as a weapon against Israelis, most recently against former foreign minister Tzipi Livni in December, 2009. "For those of you who can handle the 'naked truth' . . ."
DALLAS (KRLD/AP) - Southwest Airlines suspended a pilot whose disparaging comments about gays and older flight attendants were transmitted over an air-traffic control frequency. The pilot was talking with another crew member and apparently didn’t realize that his microphone was on. ENGLISH TRANSLATION: "Only those mature enough to handle the Working Class Idiom without false indignation should expose their ears to this magnificent rant." - S.L. Air Traffic Control in Houston told pilots in the area to check if their microphone was stuck open. Southwest said Wednesday that the pilot was reinstated after going through diversity training (i.e re-education - S.L.). STORMBRINGER GUIDANCE: EVERYBODY needs to "CHECK SIX" early and often, check the status of your mike and everybody else's, and end every sentence containing certain 'creative euphemisms' with the qualifier: "NOT THAT THERE'S ANYTHING WRONG WITH THAT . . ."
THIS IS WHAT I'VE GOT TO SAY ABOUT IT: I'm a taxpayer, a veteran, and a self-employed business owner: I help make this country work. I'm also an immigrant, an Asian Pacific Islander, I'm in a mixed-race marriage and my kids are AmerAsian . . . Now you can make what you want of all that; I am not now, nor have I ever been 'Politically Correct' - and I'm also not uptight. if you're a productive member of society then I don't care about the color of your skin, what religion you are, whether you're male or female and I don't want to know about your sexual kink or orientation - just keep it in the closet where it belongs. If what I say, think or do offends your virgin ears, get off the boat. The rest of you, feel free to hunker down, fill your hands with shootin' irons and help me keep the world safe for Democracy - "The Good Lord Willing and the River don't Rise". 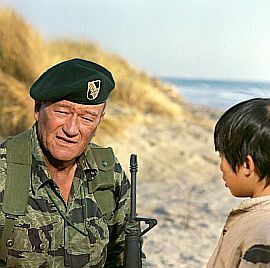 You're what this is all about, Green Beret!" I have built a bridge which will last forever. Why the Arch? To me the Arch symbolizes strength, teamwork and cooperation, and a concept of the services I provide - security consulting and technical solutions to challenges faced in military combat. 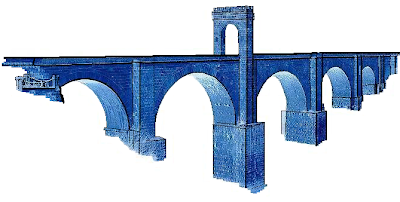 The arch is a very strong structure that spans a space while supporting weigh, and yet no single spot holds all the weight. The Romans did not invent the arch, but exploited the concept in their prolific architecture, together with a construction material they did invent; cement. An arch requires all of its elements to hold it together. 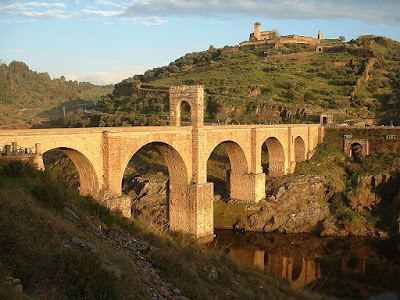 The Roman Arch also symbolizes inspiration from the Ancients of the Classical Era, whom I frequently consult for wisdom and guidance. 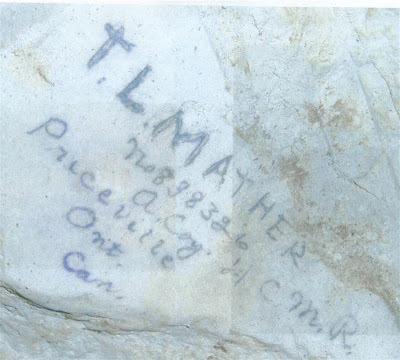 My great-uncle, Thomas Laidlaw Mather, fought for Canada at Vimy Ridge, and later died at Paeschendale. There is a tombstone for him at Tyne Cot Cemetary at Ypres. He wrote his name on the wall of the "Goodman" tunnel at Vimy, and this graffiti was featured on the History Channel's special about Vimy Ridge a few years ago. I understand this tunnel has since been closed. My husband & I will be touring Belgium next month, so I have researched the story of my great-uncle. 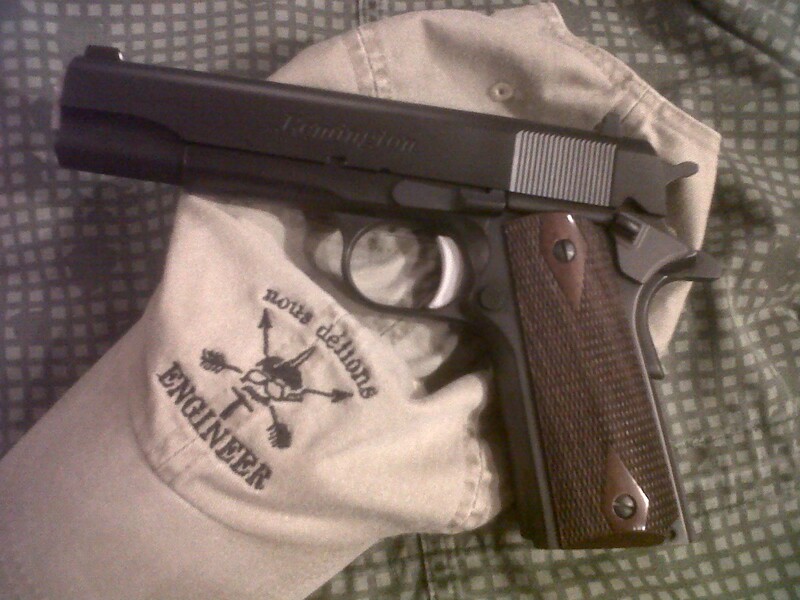 I will include the story which I submitted to the 4CMR website and some pictures I have. If you come across any evidence of my uncle being in the tunnels you are researching, I would be thrilled to see pictures of it. 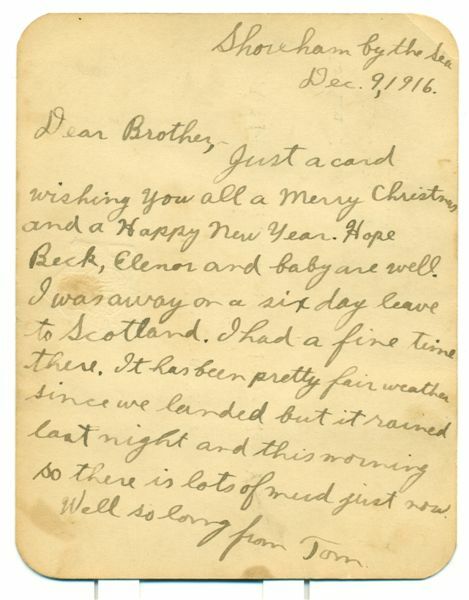 NOTE: Mrs. W. refers to this post about the carvings made by Canadian soldiers of the First World War as they slept, ate and waited in a cave in northern France - S.L. Thomas Laidlaw Mather, born September 9th, 1897, was the youngest child born to John and Mary Ann (Laidlaw) Mather, who owned a farm at Priceville, Ontario, Canada. His father, John, died in 1901 from injuries after being kicked by a horse. Tom’s brother, William, 14 years his senior, ran the farm so Tom could remain in school. 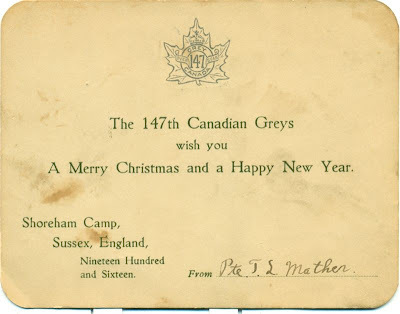 Tom enlisted with the 147th Grey Owen Sound Battalion, Canadian Expeditionary Forces, on November 30th, 1915. 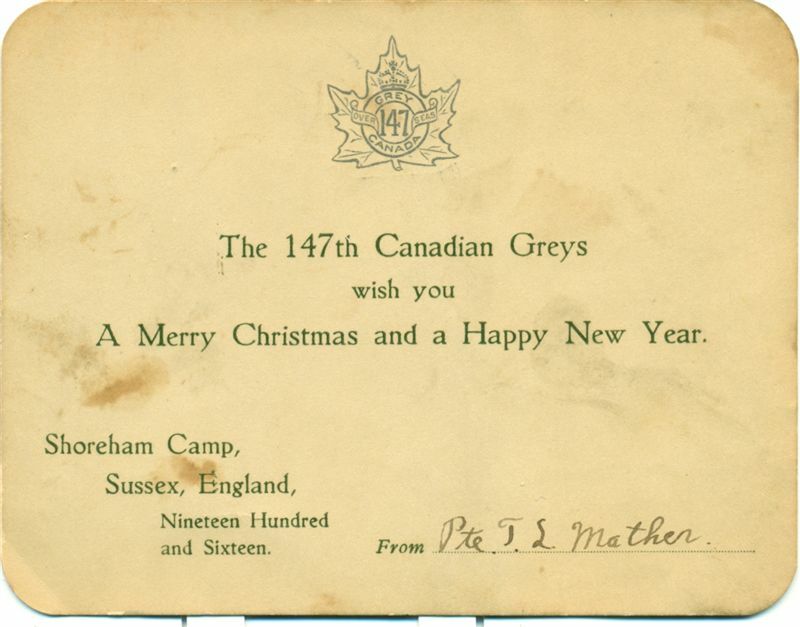 The 147th trained in Grey County until the spring of 1916, when they moved to Camp Niagara. The Battalion relocated to the newly opened Camp Borden, in July 1916, to continue their training. They then moved to the Maritimes in the fall and boarded the RMS Olympic, which was the Titanic’s sister ship and was being used to transport troops to Europe. They arrived in England on November 20th, 1916, and proceeded to Shoreham-by-the-Sea, Sussex, for further training. Between February and June of 1917, some 350 men of the 147th BN were transferred to the 4th CMR. Tom joined them in the field with the bulk of the 147th on March 7th, 1917, and served with 'A' Company during the assault on Vimy Ridge in April 1917. There, in the underground tunnel system, he wrote his name on the wall of the "Goodman Subway". 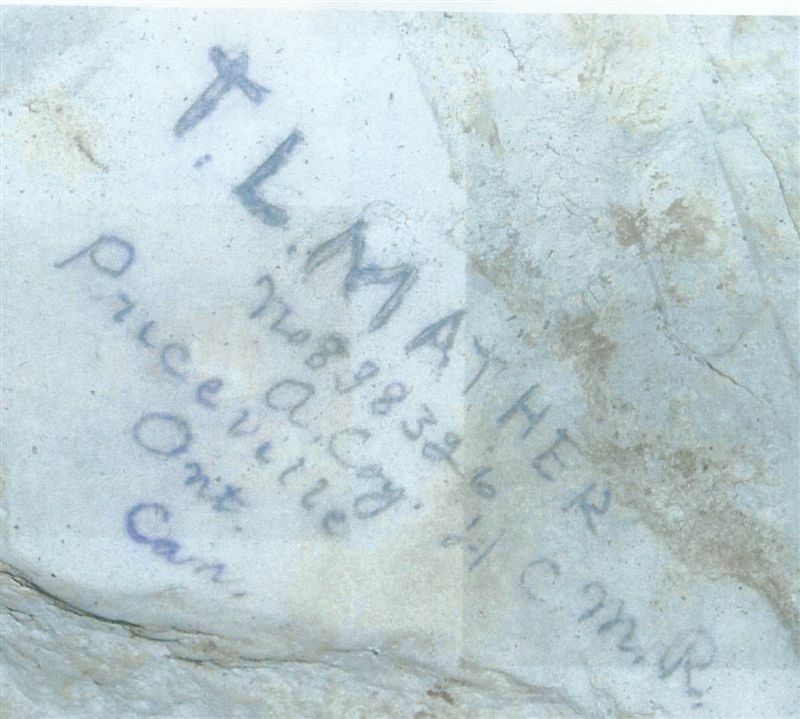 A clip of Tom’s graffiti was shown on a television special entitled "Vimy Ridge: From Heaven to Hell", which first aired on the History Channel in Canada, the US and Europe in 2007. This subway system has been explored and documented by the Durand Group but unfortunately was closed to the public due to safety considerations in 2008. October 26th, 1917, was the first day of the "Second Battle of Passchendaele", and Tom served on the right flank which was being held up by heavy machine gun fire from a German pill box. 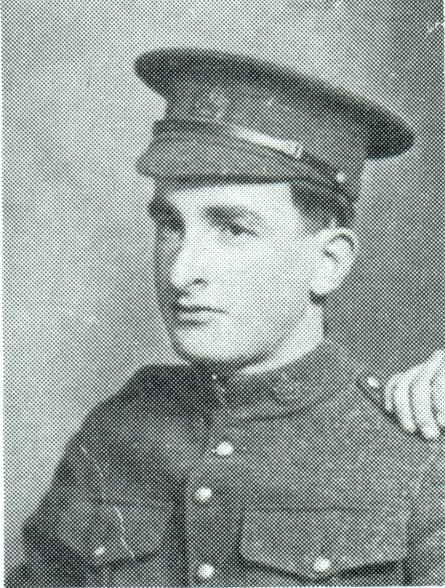 It is interesting to note that during this same battle, one of Tom’s comrades from the 147th, 19-year-old Private Thomas Holmes from Owen Sound, Ontario, became Canada’s youngest recipient of the Victoria Cross for single handedly and repeatedly rushing a German pill box and destroying it by throwing bombs into it. 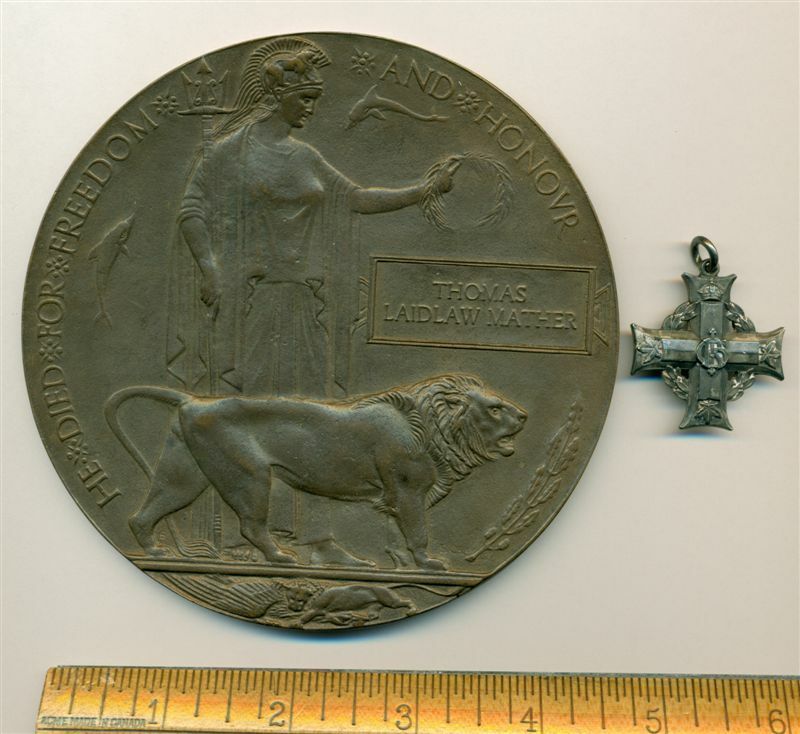 Most sadly, Private Thomas Laidlaw Mather, aged just 20, lost his life on the opening day of the battle. Tom’s mother received a letter stating that her son was missing in action, and later received the Memorial Cross and Plaque. 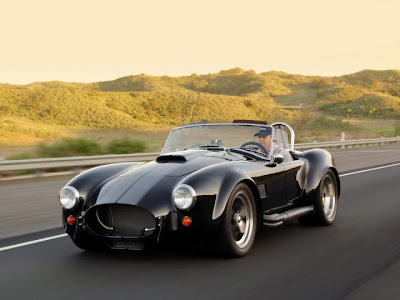 The Mather family was troubled that they never fully knew what had happened to Tom, until a chance meeting in the 1960’s with a person who was previously unknown to them, but was a relative of the wife of Tom‘s nephew. This man was Elmer Stevens, who by coincidence had served with Tom in Passchendaele. He informed Tom’s brother, William, that he had seen Tom shortly before a shell exploded in the area where Tom had been positioned, after which Tom never reappeared. The Mather family was extremely grateful for this information. There is now a headstone for Tom at the Tyne Cot Cemetery, Zonnebeke, near Ypres (Ieper), Belgium. His name is also recorded on the Mather family tombstone in Priceville, Ont., as well as on the Priceville Cenotaph erected in October 1921 in memory of the local men who had lost their lives in WW1. The Mather family is appreciative of the work of the Durand Group, who researched the Vimy tunnels, and especially to Ian of www.4cmr.com for his work at maintaining the 4th Canadian Mounted Rifles web-site. Biography credit to the nephew and great-niece of Thomas Mather. They should re-name it Operation Dumb and Dumber. The lethal fallout from a botched operation by the US Department of Justice which allowed almost 2,000 illegally purchased firearms to be transported from the streets of Arizona to drug gangs in Mexico has been laid bare in a scathing Congressional report, which concludes that it resulted in countless deaths. A mixture of arrogance, over-confidence, and staggering ineptitude by the Department's Bureau of Alcohol, Tobacco, Firearms and Explosives [ATF] was outlined in a 51-page investigation by two Republican members of a House panel charged with getting to the bottom of what went wrong during a two-year operation called "Fast and Furious". 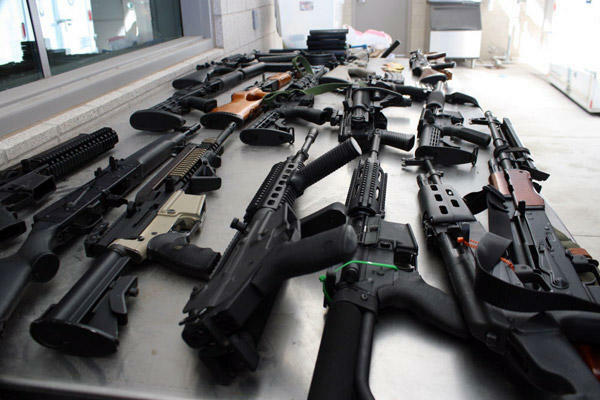 It tells how, between 2009 and this year, the ATF instructed agents to turn a blind eye to hundreds of AK-47 assault rifles, sniper rifles, and revolvers purchased from gunshops in Phoenix and en route to Mexico. 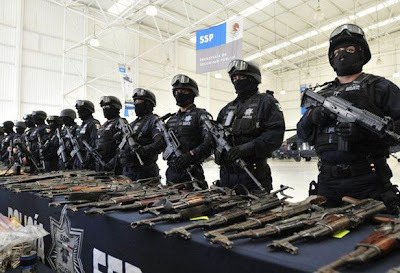 They hoped to eventually recover them from crime scenes and build a complex conspiracy case that might take down the leaders of a major drug cartel. In the event, the operation resulted in the arrest of a handful of small-time crooks. But it exacerbated an already-huge spike in violence on both sides of the border. 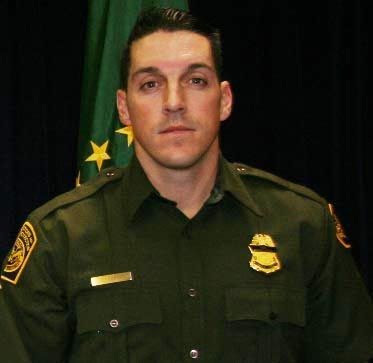 Two of the guns allowed to "walk" into the hands of criminals were used in a shoot-out that killed a US border patrol agent, Brian Terry. Bear in mind this insanity was perpetrated by the same people who think Ronald Reagan should have been impeached over Iran-Contra. Congress needs to find the idiots who dreamed up this nightmare, give them a fair trial, then lock them up and throw away the key - S.L. My Dad (on the left) at one of the power plants he built - the gentleman on the far right is Kasem Chatikavanij, General Manager of the Electrical Generating Authority of Thailand, later Minister of Industry for Thailand. My Dad's story is incredible - he started out a country kid from Woodend, Victoria, where my grandfather had a pub. School was finished for Dad at age 15 and his first job was riding a bicycle, doing deliveries for a chemist (that's a drugstore here in the States). This was in the depths of the Great Depression, life was hard, and opportunities were few and far between. During World War II Dad got his break - an apprenticeship as a machinist in the shipyards in Williamstown, west of Melbourne. My Dad worked hard; as hard as anyone has ever worked in their life. He went to night school and earned a tech school diploma as a machinist - riding the trams late at night after a hard day in the shipyard, cracking the books and studying hard. I've seen the books he studied; thermodynamics, principles of steam power generation - what they called a machinist in 1940s Australia is really what we call a mechanical engineer today, and somewhere along the way Dad parlayed that tech school certificate into just that. There was a greater sacrifice; my Dad is an artist. He studied drawing and painting. There were always books around our house dedicated to art; the incredible works of Michelangelo and Da Vinci; the bright vivid colors of the Impressionists, Van Gogh and Gauguin. But when he was young, the life of a starving artist simply wasn't a realistic course of action for a member of the working class with a wife & kids. And so he nugged it out in the machine shops, turning and shaping metal on lathes and drill presses. Opportunity presented itself in North America and Dad made his move, securing a job in the design office of a project in Seattle, Washington. Mum & us kids (there were only two of us at that time) stayed in Vancouver until Dad could work something with U.S. Immigration and get us across the border. That was the start of my Dad's incredible career as a consulting engineer; he built industrial sites in all over Asia and here in the United States. A urea processing plant in Sumatra, Indonesia; three huge electrical power plants big enough to power the cities - one in Bangladesh and two in Thailand - a city water supply facility in Turkey, and several projects here in the United States. Nothing ever held my Dad back - he could do anything. 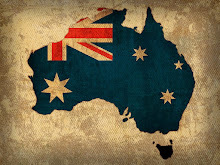 And so my brothers and I grew up overseas and lived the amazing ex-pat lifestyle; an education no school can provide. I still remember when I was six, in Indonesia - my dad built a classic, clinker-hulled dinghy with a mast and lateen-rigged sail and a 1.5 horsepower Seagull outboard. The sail was hand sewn from old rice sacks and the spars were bamboo. I remember Dad taking me up the river, and I remember the banks of that river lined with crocodiles basking in the sun. We stopped and visited a native village; bamboo longhouses up on stilts. It was a scene right out of a Conrad novel (even though I didn't know it at the time). By the time I was a teenager I'd had adventures most kids cannot even imagine. Of course we had no idea whatsoever how hard life really is, no concept of how hard Dad worked each and every day of his life. Dad's greatest frustration was probably trying to infuse the work ethic into us. There were work projects and chores, but nothing like what he went through as a kid; so one summer vacation my Dad arranged for my older brother and I to work in a factory in Sydney (it was winter down there) - that was an eye-opener for an expat kid from Southeast Asia, let me tell you. Dad told us stories of his life; trying to make it as a kid in the shipyards, and somewhere along the way some of it stuck. He taught us that for anything you want in this Life you have to work hard, that hard work is it's own reward, and if a job of work is worth doing then it's worth doing right. He taught us to always be courteous, to speak clearly and correctly, to always say "Sir," and to always say "please" and "thank you". Despite his own 'School of Hard Knocks' background - or more likely, because of it - my Dad is an optimist; he taught me that as hard as this World is, it isn't always 'Dog eat Dog', it's more like 'Friend Help Friend', and that if you worked hard and played it straight and true, somewhere down the line somebody would be willing to lend a hand when you needed it. Dad taught me valuable skills; how to work with tools, caring for and sharpening blades, small engine maintenance and repair. To this day I can sharpen any blade - axes, lawnmower blades, machetes; all my military knives are razor sharp. Dad taught me drawing; how human and animal figures can be developed from cubes, cylinders and cones; perspective, texture, shadow and form. What my Dad taught in maths and technical drawing - together with my own humble credentials as a military engineer - has led directly to my present career in industrial security. Everything I've got in this Life I owe directly to my father's influence. He taught me that "God loves a tryer" - no truer words - that if I worked hard and tried, I might fail and fall flat on my face - and I have a couple times - but that if I picked myself up each and every time and kept on trying, in the end I'd always make it. 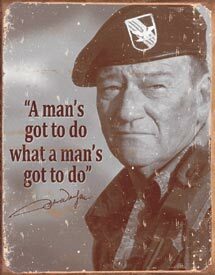 My father's words got me through my darkest hours, the hardest times in Special Forces, and they inspire me to this day. My Dad is a success story in Life, greater than most. 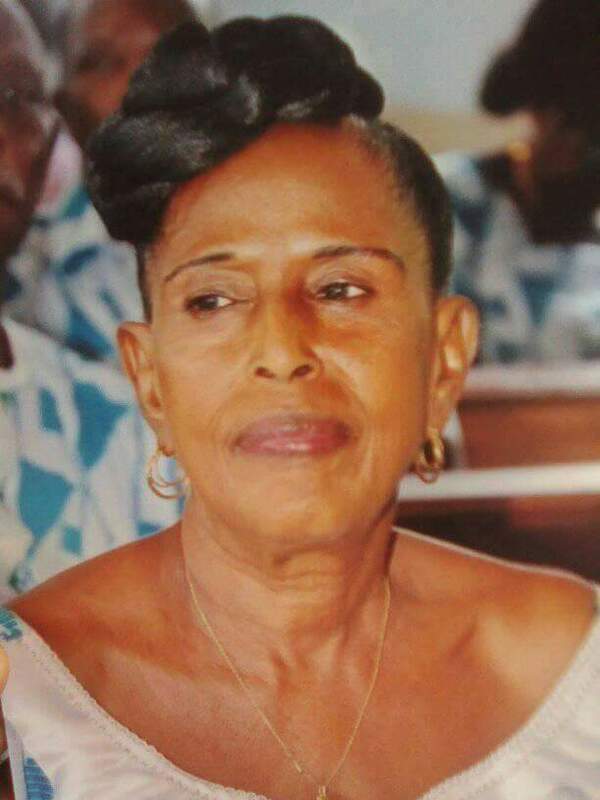 He gave us kids the best educations, we wanted for nothing, and he honored my mother - a saint - who passed away eleven years ago this coming September. In retirement Dad returned to his first love, art. He took up oils and won several medals and blue ribbons for his works, and achieved significant success in selling them. Of course, he accomplished this with the help and support of his second wife, my step-mother Ruth, who is also a saint. Dad is generous to a T; he has graciously helped every member of our family. It is impossible for me to thank my Dad enough for all he's done - the only way I know how is to live my life as best as I can, and to dedicate my achievements to him. If could ever achieve ten percent in my lifetime of what my Dad did in his - given his humble beginnings - I'd probably be Prime Minister of Australia by now. from Sean, TigerLily & the kids . 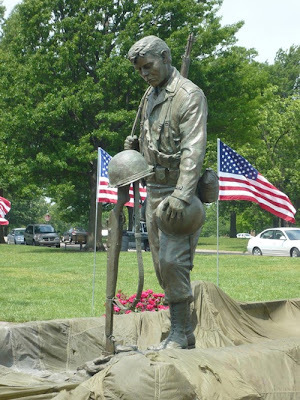 . .
"Homage," by Kansas sculptor Jim Brothers, was on display in Topeka this past Memorial Day weekend. The eight-foot-tall statue in bronze will be unveiled at a dedication ceremony today - June 18 - at the Wine Street Memorial Park in its permanent home in Culpeper, Virginia. The tiny village of Bedford, Virginia (pop. 3200) lost 19 of its 35 soldier sons on Omaha Beach, 6 June 1944. Four more were dead within weeks - S.L. 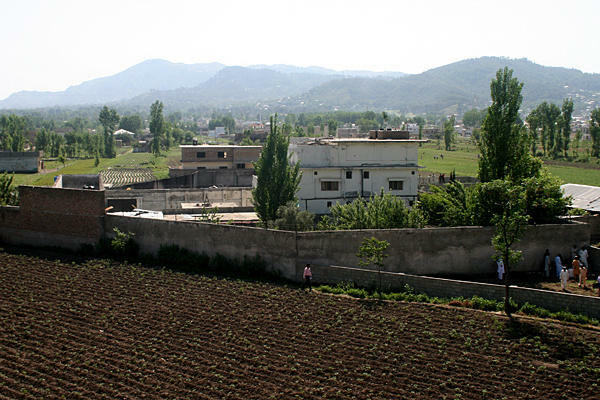 Vice President of Intelligence Fred Burton examines the sophisticated surveillance operation that led to the raid on Osama bin Laden’s safe house in Pakistan. In this week’s Above the Tearline, we thought we’d take a look at the highly sophisticated surveillance operation that took place many weeks before the SEAL Team Six takedown of the Osama bin Laden safe house. In the aftermath of the bin Laden takedown, most of the mainstream media has been focused on the brilliant SEAL Team Six assault on the compound. What we would like to take a look at is the highly sophisticated CIA surveillance operation that took place on the courier, who was bin Laden’s lifeline to the free world. Trade craft wise, the surveillance of the courier is the brilliance in this operation in my assessment, meaning you had to set up a standalone safe house in country for a CIA team to operate it in without the knowledge of the Pakistani government. 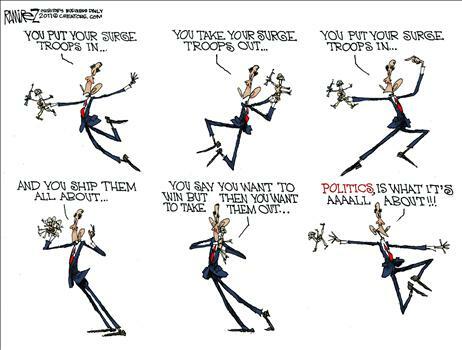 In essence you’re operating behind enemy lines. One of the other concepts of operating a unilateral surveillance team in a foreign country is the notion of third-party intelligence services trying to figure out what you’re doing. Such as the Indian Intelligence Bureau, the Russian SVR, as well as the very aggressive intelligence capabilities of and organizations such as al Qaeda getting wind of what your team could be doing. The personnel operating in this surveillance team are on a very dangerous mission. In essence, if caught they are committing crimes against Pakistan and they are on their own. They’re operating - the term is black - in country so the U.S. would not acknowledge any activities on the part of our government if the surveillance team had been picked up before the bin Laden operation went down. The courier was operationally very secure. For example he would remove his cell phone battery so the cell phone could not have been used to track his movements to the compound. And think about the surveillance team and the ability to follow that man without getting caught. At any point along this operation if the courier saw the surveillance team, the operation would’ve been blown. I know from first-hand experience in the Ramzi Yousef case, the mastermind of the first World Trade Center bombing, that elements within the Pakistani ISI cannot be trusted so this is why the CIA decided to put together a unilateral operation once they had the lead on the courier. And the logistics, and the care and feeding and the backstop of what took place to get this team into country to surveil all the courier from many, many weeks before the bin Laden operation is probably the most brilliant CIA surveillance operation in quite some time. The Dodge City Peace Commission: Front Row, left to right: Chas. 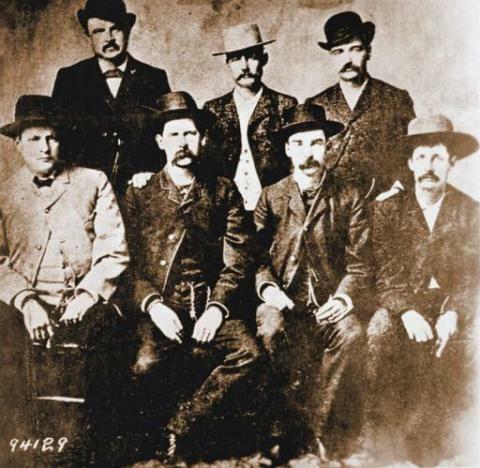 basset, Wyatt Earp, Frank McLain, Neal Brown. Back Row, left to right: W.H. Harris, Luke Short, Bat Masterson. Over the years I've seen excerpts of this wisdom elsewhere; on bulletin boards in company headquarters and teamrooms throughout SF-dom. 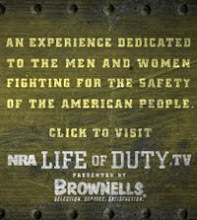 Here it is published in it's entirety in the online site of Field & Stream of all places . . . enjoy - S.L. Normally, this blog is dedicated to peaceful pursuits. However, SFC Frick speaks much wisdom. I am giving him a meritorious promotion to Command Sergeant Major. 8. If you are not shooting, you should be communicating, reloading, and running. Yell "Fire!" Why "Fire"? Cops will come with the Fire Department, sirens often scare off the bad guys, or at least cause then to lose concentration and will . 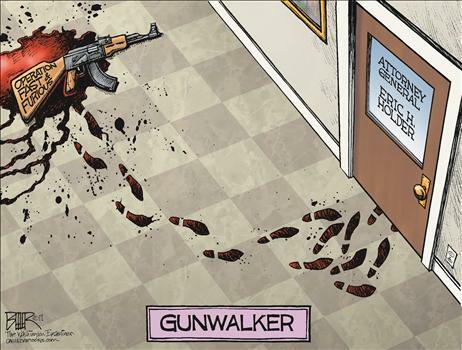 . . and who is going to summon help if you yell "Intruder," "Glock" or "Winchester?" 13. 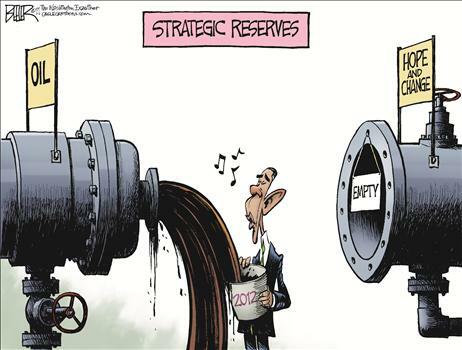 Have a back-up plan, because the first one won't work. "No battle plan ever survives first contact with the enemy." "There will come a day . . . " the Old Sergeant Major once told me ". . . when you find out you've got more time in the harness than the kids coming onto your team have in the Army . . .
. . . when that day arrives, it's time to pack it in and move out sharply . . . to the lucrative contracts that await in the Happy Hunting Grounds of Post-Military Retirement . . . "
Officials said Monday that the CIA is preparing to launch predator drone strikes in Yemen to kill al Qaeda militants, taking advantage of the power vacuum in that country. The U.S. previously has operated strikes against militants in Yemen - the country is home to American-traitor the radical cleric Anwar al-Awlaki - but these were conducted with the knowledge of Yemen's government. The CIA program will have different legal restrictions, and will be modeled after the Pakistan strikes - conducted without express permission of the country. The CIA program was originally slated to begin in July, but officials say it has been pushed back a few weeks due to logistical concerns. Washington is worried that Yemen's power vacuum will allow radical al Qaeda militants to come to power. Rick: If that plane leaves the ground and you're not with him, you'll regret it. Maybe not today, maybe not tomorrow, but soon and for the rest of your life. Rick: We'll always have Paris. We didn't have it before . . . we'd . 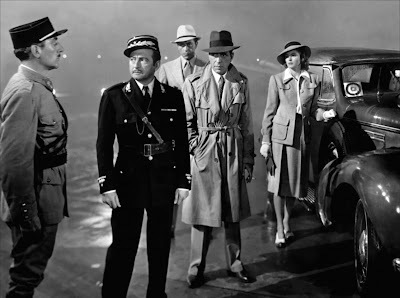 . . we'd lost it until you came to Casablanca. We got it back last night. Ilsa: When I said I would never leave you . . .
Rick: And you never will. But I've got a job to do too. Where I'm going, you can't follow. What I've got to do, you can't be any part of. Ilsa, I'm no good at being noble, but it doesn't take much to see that the problems of three little people don't amount to a hill of beans in this crazy world. Someday you'll understand that. Here's looking at you, kid. No I'm not going to join a Free French garrison over at Brazzaville . . . that family business I spoke of the other day is going to absorb a lot of time & energy over the unforeseeable future . . . posts will continue intermittently . . . thanks for all a y'all's support . . . S.L. "Major Strasser's been shot! Round up the usual suspects!" WOULD YOU TRUST HER WITH NUCLEAR WEAPONS?